The Vespa brand is perhaps the most globally recognisable motor-scooter brand in the world. Manufactured by Piaggio, an Italian scooter company, and Europe's largest manufacturer of two-wheeled vehicles, the Vespa is famous for its unibody construction, which provides practicality as well as looks. Its body encloses the mechanicals, and protects the rider's feet, along with providing wind resistance. Founded in 1946, by the mid-fifties the Vespa had evolved further with the introduction of the 150cc range. It took the rear suspension and other enhancements from the previous 125cc version, and added a longer seating area and the faired in handlebar/headlight unit. 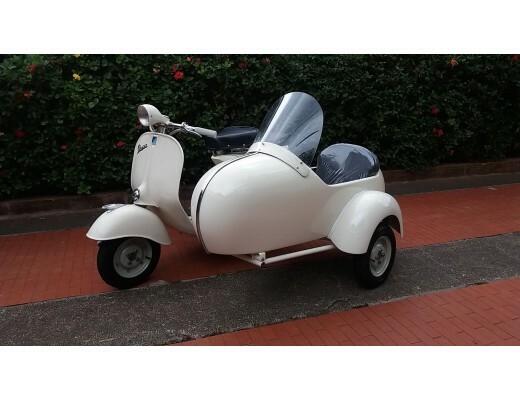 Many Vespa enthusiasts today believe this model to be one of the most desirable of all Vespas, particularly in sporty 'Gran Sport' (GS) form with its larger, more elegant bodywork and standard equipment including a speedometer and Silver paintwork. Its engine was also tweaked to produce more power, with an 8bhp rating instead of the standard 5.4bhp.